Cleo's Bath is a favorite hiking spot for many sun worshipers especially on weekends throughout the late spring and early summer months. 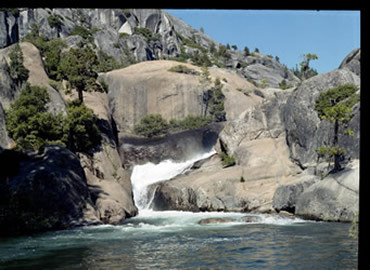 The pool is surrounded by slabs of granite that are steep and often slippery. The pool itself is fairly shallow and the water is literally freezing until late summer. Above this pool are a couple more pools that cascade down the canyon into this one. These are not as crowded on the weekends. 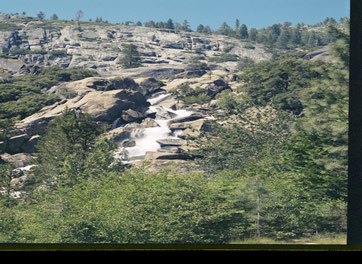 Looking toward the west, the water plummets over the granite boulders to the bottom of the South Fork of the Stanislaus River. Standing at the west side of Cleo's Bath, one can look down the canyon towards Pinecrest Lake. It is an awesome sight. Depending upon the winter snowpack, by the end of July or first part of August, the water may be reduced to just a trickle...and not too inviting scenery-wise without water. 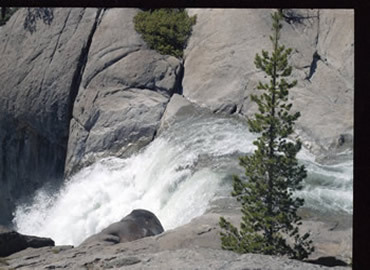 The best time to take this hike is late Spring and early Summer when the water is at its peak flow. Follow the Pinecrest Lakeshore Loop Trail on the south side of the lake. At the east side of the lake, there is a small meadow where a Boy Scout Summer Camp used to be. Just as the trail begins to climb again, you will see the Cleo's Bath Trail sign. From this point, the distance to Cleo's Bath is only one and a half miles. 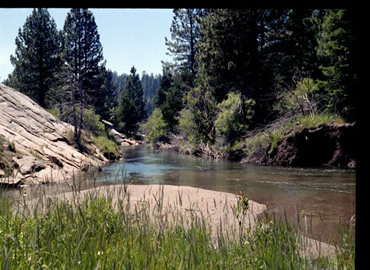 The trail parallels the South Fork of the Stanislaus River (a short distance to the left). Continue climbing gently through the forest and granite. You may notice cables and spikes laying alongside the trail and a little farther you'll see the remnants of a steam-donkey engine just to the right. This engine was used to build Eleanor Dam in the late 1850's. You may want to take a slight detour at this point and walk toward the left. There, at the river's edge, you will see what remains of Eleanor Dam. Return to the main trail and as you continue, notice the waterline of the reservoir on the rocks. Follow painted arrows over the slick granite to the meadow below. Shortly thereafter, you will walk through a high thicket along side a stream and then you are at the base of the headwall. Here the obvious trail ends. From this point forward, one has to rely on ducks (three rocks stacked on top of each other) to reach Cleo's Bath. It is a strenuous climb and at one point you are literally rock climbing, but upon reaching Cleo's Bath, it was worth the panting. The trail continues on to other destinations ...including Waterhouse Lake. But for a nice day hike to Cleo's Bath, one couldn't ask for anything more relaxing than stretching out on one of the granite slabs and sun-bathing for the day.